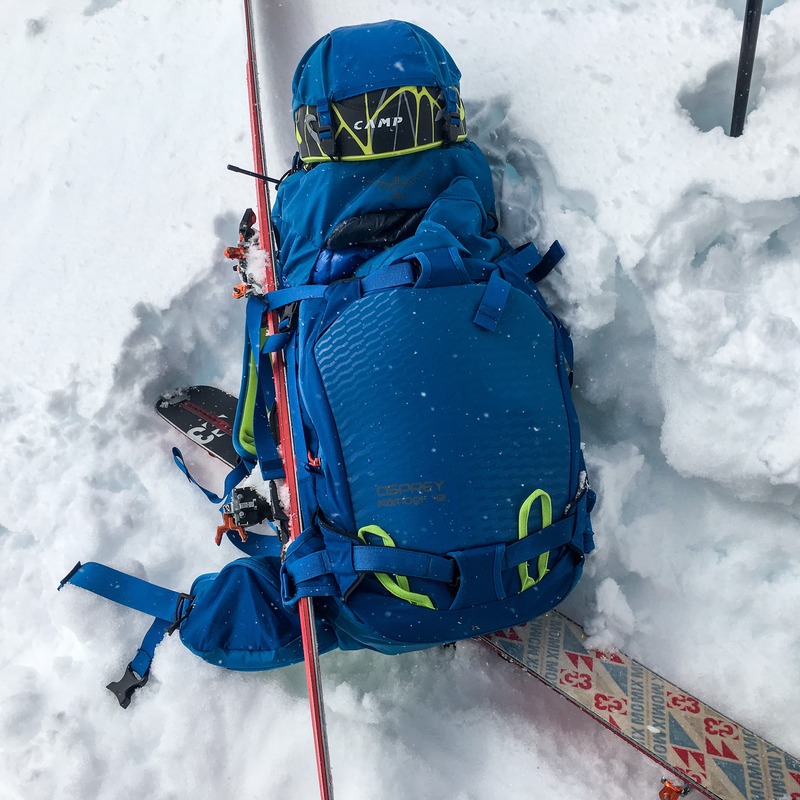 Osprey’s new Kamber line of packs replaced the familiar Kode line and features a trio of pack packs specifically designed for the needs of the male ski touring or splitboarding crowd. The female version of the packs are found in the Kestra line. 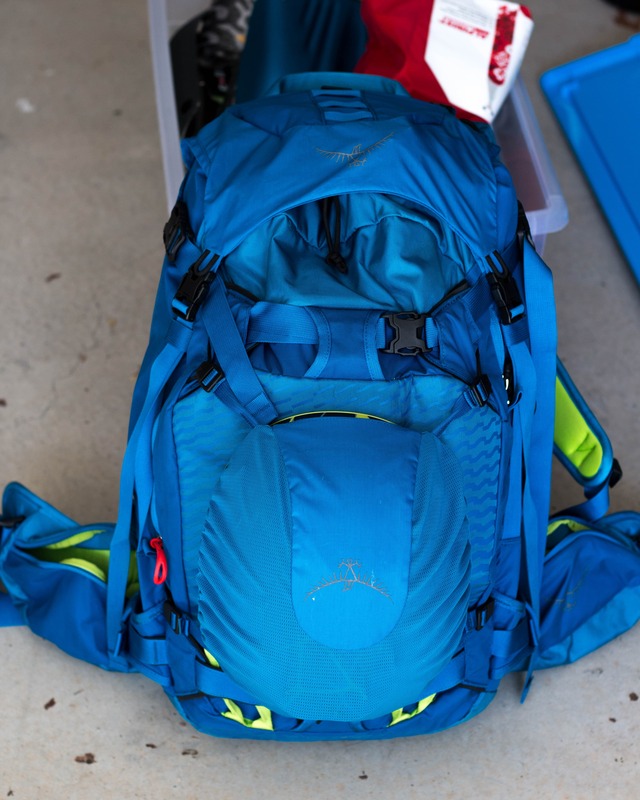 This review focuses on the largest of the Kamber packs, the Kamber 42. 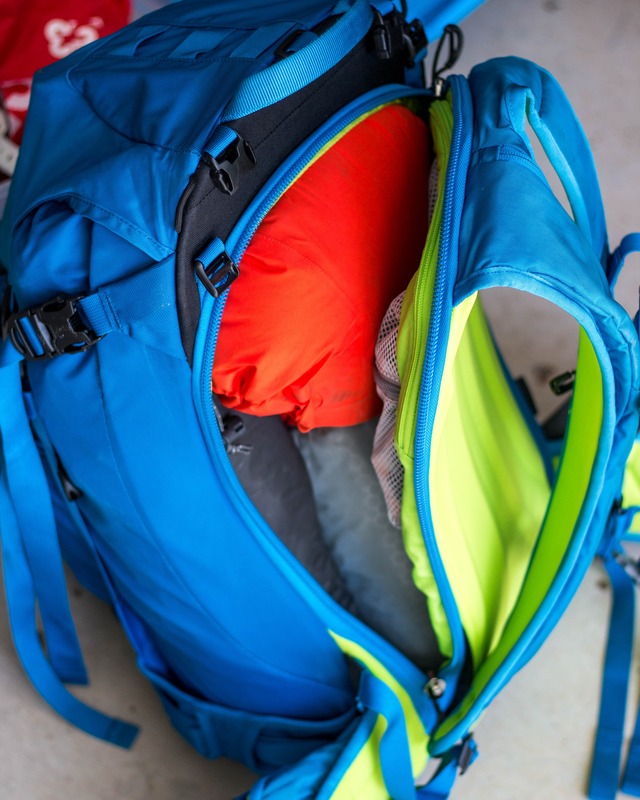 A cavernous pack that’s meant for multi-day trips but can still be stripped down for shorter forays into the backcountry. 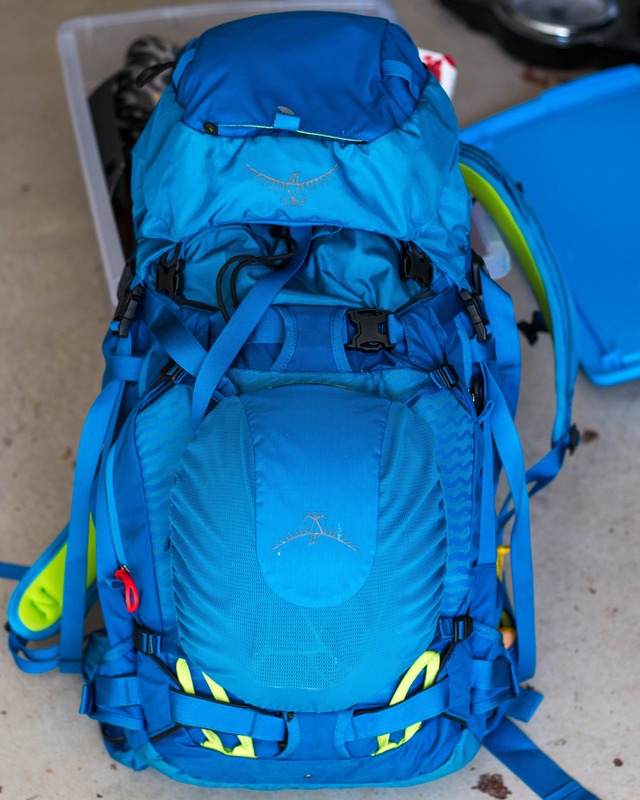 The other two packs in the line are the Kamber 32 (click on the link for our review) and the 22. Getting set-up for a boot-pack while out testing the Kamber 42 in the Coast Mountains of BC. Osprey has outfitted the top loading Kamber 42 with an impressive array of features. Now while this produces a very customizable and versatile pack it also makes it a bit heavier and more complicated. The Kamber 42 has several access options and configurations with numerous straps/clips which could make a written description complicated so I’m going to try to use photos where I can. The top access to the main compartment with the FlapJacket pulled back. 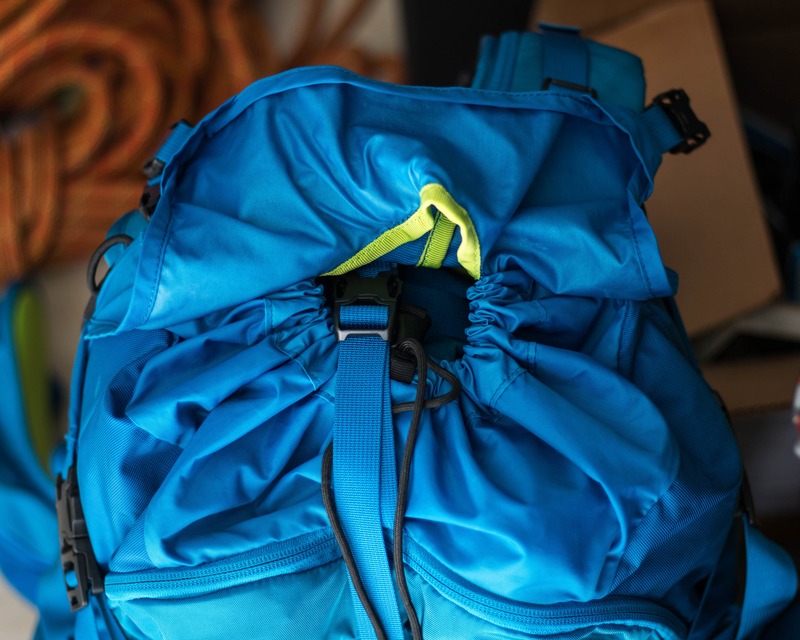 The “rope strap” that can be seen extends from the top of the avy compartment to the inside of the main compartment and helps to pull weight closer to the back helping the pack to carry well. Starting with the main compartment, there are two access points: one on the top and the other on the back panel. 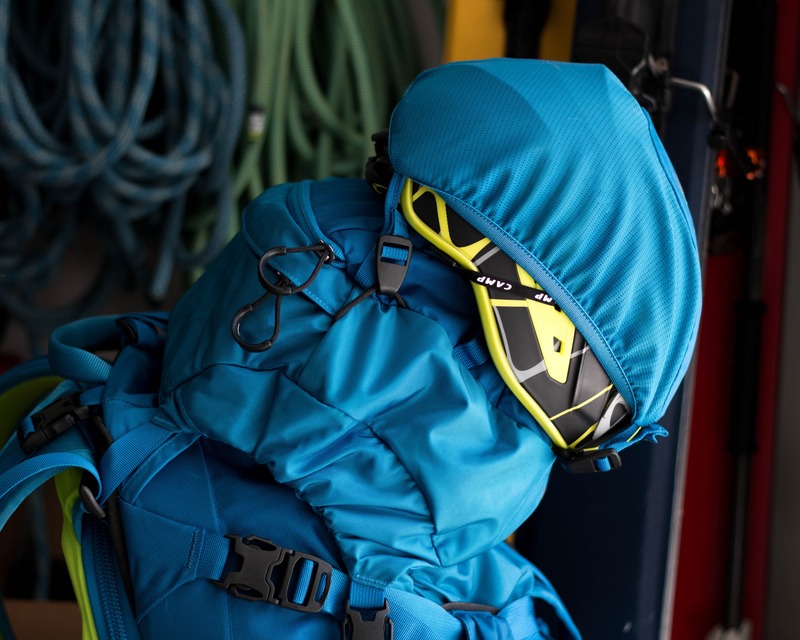 The zippered back panel provides quick and easy access to everything in the main compartment including the gear stashed way down at the bottom without the need to take anything out. It also provides easy access when skis are strapped to the sides of the pack. A very convenient feature. The top access has a drawstring closure. Rear access panel zipper is located behind the shoulder straps. The lid can be removed when not needed and the flap jacket used to seal the top of the pack. This drops around 4-5 liters from the pack and gives it a lower profile. Great if you’re planning to use it for shorter trips or day tripping from a base camp and don’t need the extra room. However, it would be nice if the flap jacket could be tucked into a pocket when not in use. Kamber 42 with Lid in place and a helmet attached to the back. Kamber 42 with FlapJacket in place and a helmet on the back. Helmet attached to the top of the pack. The clips that hold the top lid (or flap jacket) down are clipped over the side compression straps. Well, it’s actually just one continuous compression strap that extends from one side of the pack to the other. Anyway, the side compression strap clips over the zipper for the avalanche kit compartment. Pulling the top lid down tight and sucking in the side compression strap creates a nice sleek package. However, it also makes it a bit onerous/slow to access the avalanche kit compartment (where I often keep my skins) and the numerous clips and straps can sometimes be confusing. Now this isn’t an uncommon design but seems a little slow and clunky on this pack. 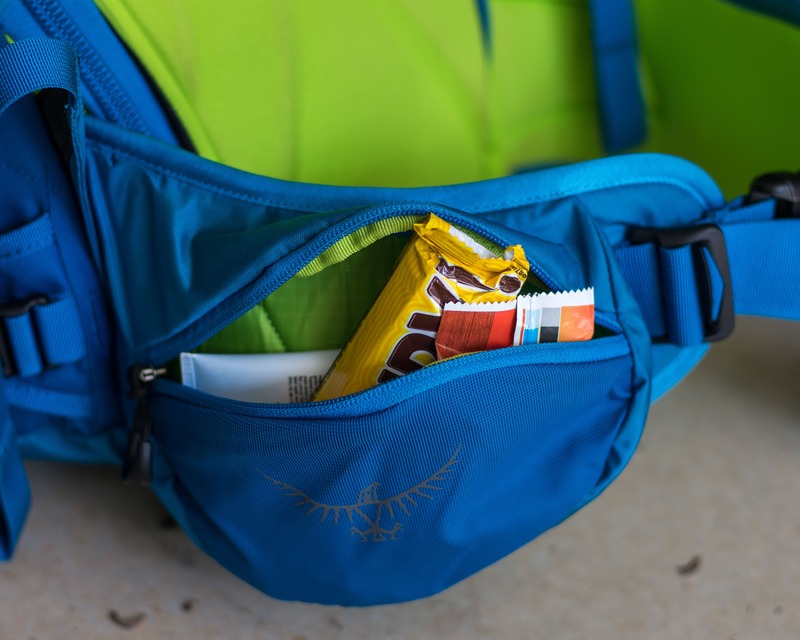 The Kamber 42 has no shortage of pockets and other organizational features. The majority of them are detailed below along with some photos. 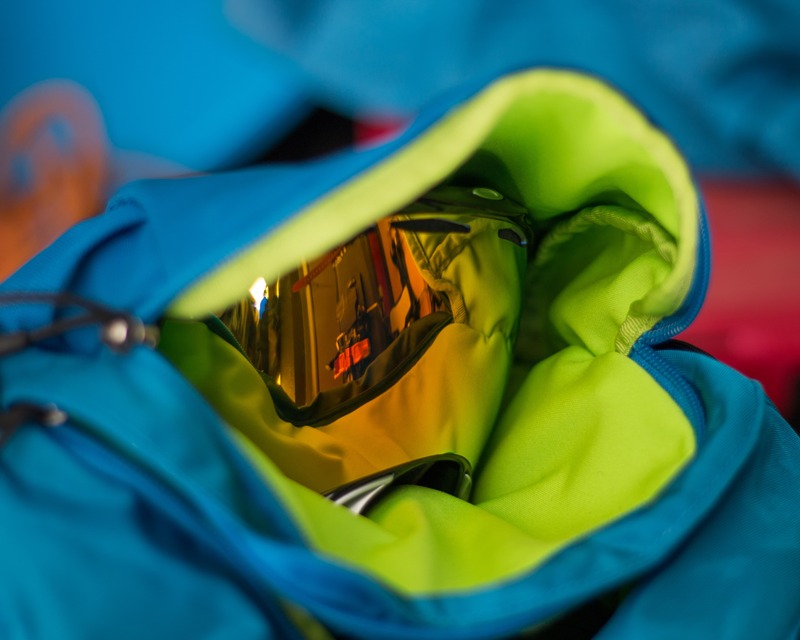 Starting at the top, the top lid has a fleece lined goggle pocket as well as the standard top-lid pocket. Under the lid is another small pocket for keys, maps, etc. 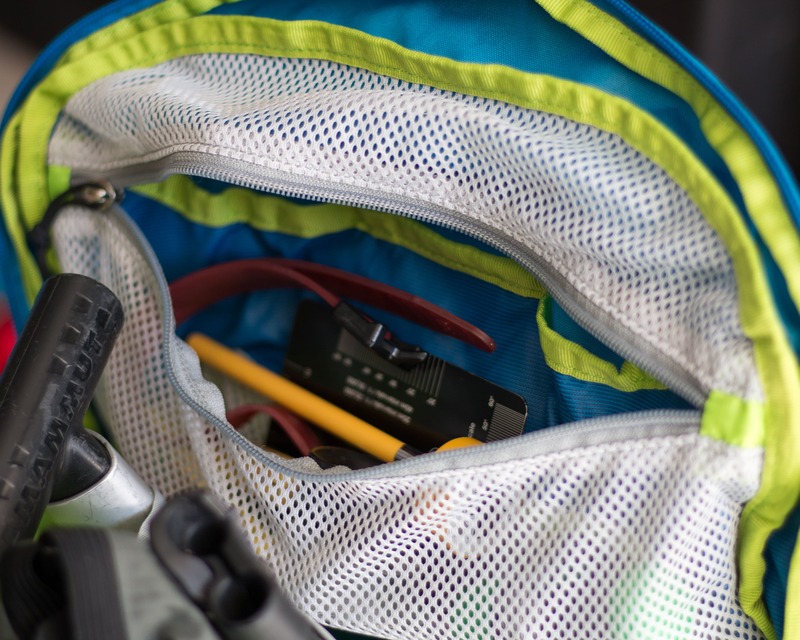 Inside the main compartment there’s a small zippered pocket against the backpanel that’s great for smaller gear that’s not needed all the time such as a lighter, headlamp, etc. There’s also a large zipper accessed hydration pouch. Having the zipper access for this pouch is great as it can be closed up tight and not interfere with packing. 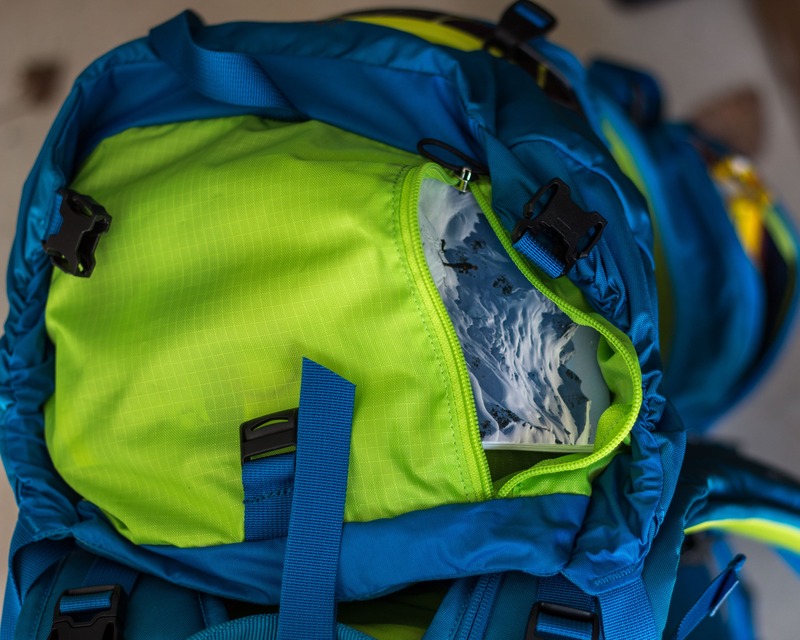 The avalanche equipment compartment at the pack of the pack contains a small gear pocket. Great for a snow science kit, repair material, etc. I wish more ski packs included this very useful pocket. Pocket inside avy gear compartment, well sized and very useful. And last on the list, Osprey included a large (huge even) pocket on both sides of the hip belt. Great for gear that you want to access quick when out touring such as sunscreen, lip balm, camera and of course wine gums (or some bars I guess). One of a pair of hip belt pockets. Osprey really thought out the helmet holder on this pack and developed an incredibly functional system. The actual helmet holder is tucked away in a pocket on the lid of the pack but not attached to the pocket as on Kamber 32. Tabs are provided on the top lid and along the back of the pack providing different helmet carry options: One on the top of the lid and the other on the pack of the pack. 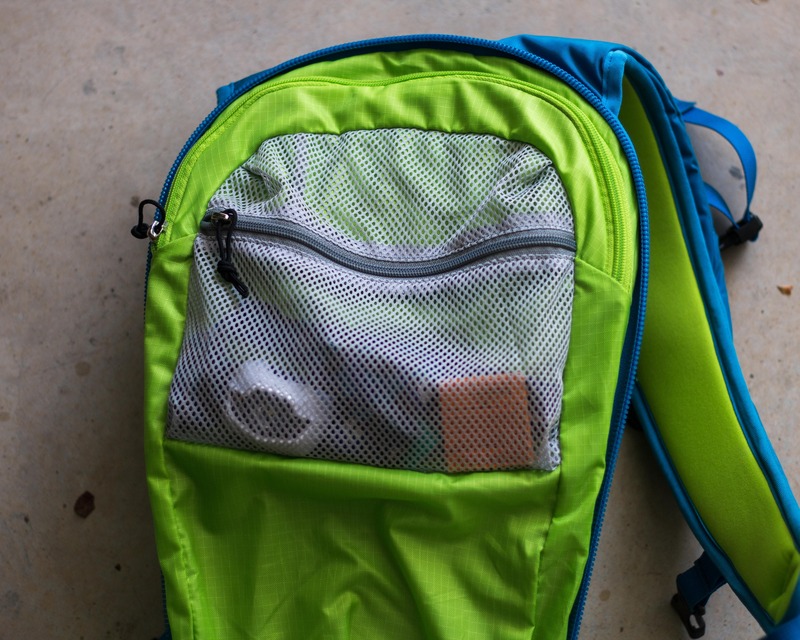 When the top lid is removed and the flap jacket in place the top carry option is still available and even more useful as pack is a bit shorter without the lid. Overall a really well designed helmet carry system. While the helmet is secured to the back of the pack in the photo one of the clip/loops used to secure it to the top of the pack can be seen by the FlapJacket clip. 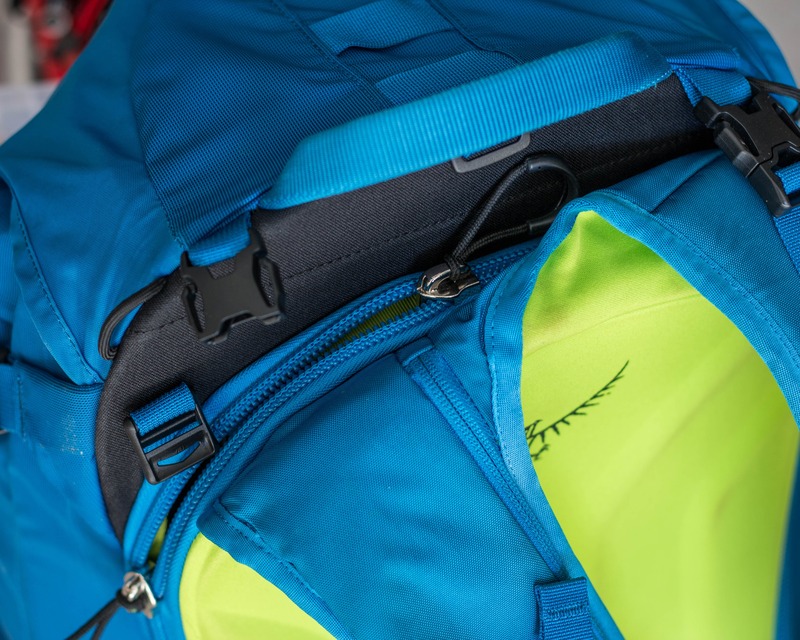 The access zipper for the avalanche gear pocket is not visible under the FlapJacket. 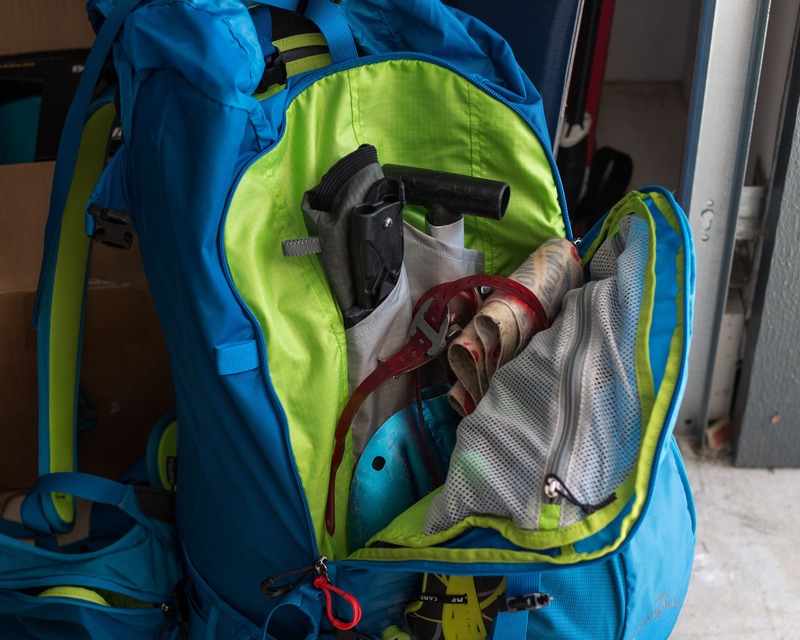 Osprey packs are among the best fitting and carrying packs around and the Kamber’s no different. 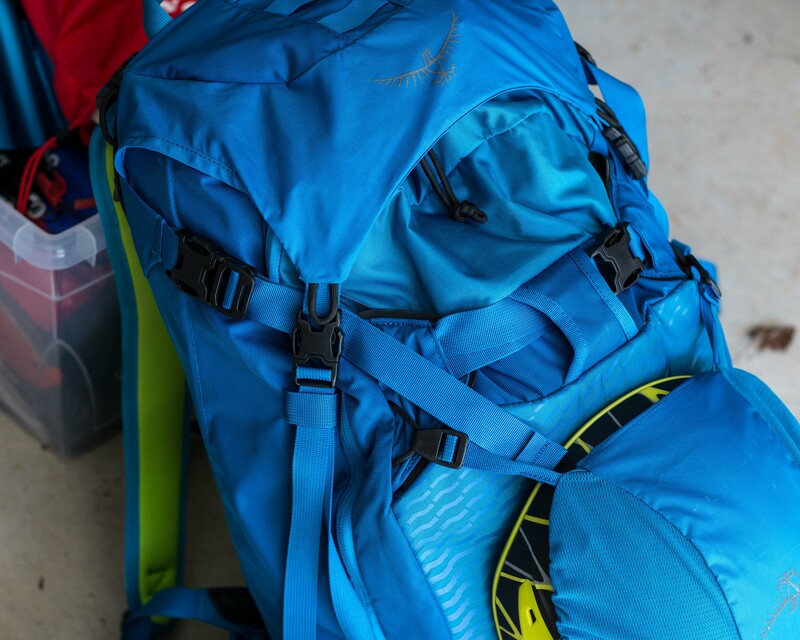 The suspension system is comfortable and secure whether the pack is pack is loaded up or just carrying a few of the essentials. It holds the pack firmly in place on both the up-track and, more importantly, when skiing down. It’s available in either S/M or M/L sizes depending on torso length and features the standard shoulder, armpit, chest and waist adjustment straps. Pros: Well featured, amazingly comfortable fit on both the way up and down, large for the size, great helmet attachment. Cons: The top of the avalanche kit compartment is covered by the lid and compression straps. Now this this isn’t an uncommon design but seems a little cumbersome after reviewing the sleek Kamber 32. And as I like to keep my skins in the avy kit compartment it slowed my transitions a bit. Overall: Sized for multi-day ski tours and hut-to-hut traverses the Kamber 42 is a great option for someone that likes a few extra bells and whistles. I was provided with a sample for review but of course this didn’t influence my review in any way.